A CUT ABOVE by Whiteflash Review - Are they the best Cut Diamonds? I am going to be taking you through the A CUT ABOVE® diamonds, offered exclusively by Whiteflash. Specifically, I shall be focusing on the cut itself, technical specifications, and of course, value for money. If you would like more information on Whiteflash and the services they offer, take a look at my full Whiteflash review. Whiteflash is an online jewelry and diamond retailer, with a particular focus on Super Ideal Cut diamonds and designer engagement rings. Whiteflash pride themselves on valuing diamond education for the buyers; as a result, their Educational pages are as clear as they are informative. Whiteflash want you to understand what you are looking for so you can appreciate the exceptional quality of their stones. Using the AGS to certify their stones, and in-house GIA trained specialists, they carry one of the largest in-stock inventories of any online diamond retailer. They boast one of the biggest collections of Super Ideal Cut diamonds, and within this falls an emphasis on their exclusive A CUT ABOVE® Diamonds. To be crowned with the title of A CUT ABOVE® diamond, the stone must first possess a triple zero rating through AGS certification. Graded on a scale of 0-10, a zero on an AGS certificate is the highest possible rating. A triple zero refers to perfect results in all three cut grade categories including light performance, polish and symmetry. Following this, the stone must meet the scrupulous criteria for a true Hearts and Arrows diamond, through image testing and visual inspections. Check for eight equal, uniform, and symmetrical hearts that are distinct and separate from the arrowheads above. Check to see if the hearts are split and if so, measure the length of heart then the length of the split. Calculate the % of the length of the split and if it is greater than 8% and there are more than 2 of them the pattern fails. Each arrow must be clearly visible with a shaft and an arrowhead. The 8 tips of the arrowheads must meet the girdle. There must be uniformity and balance. These stringent requirements allow A CUT ABOVE® diamonds to hit what Whiteflash call ‘The Bullseye’ of AGS ideal cuts. In a nutshell, this ‘sweet spot’ is a cut to reach the optimum light performance in all conditions and categories, and does not sacrifice visual performance for a greater carat yield. Essentially, it is a total focus on the finish of the diamond. An AGS triple zero grading does not automatically qualify a diamond to be considered an A CUT ABOVE® diamond. It is a combination of meticulous proportions, requirements and results that allow around 1 in 10 AGS triple zero diamonds to receive the title of A CUT ABOVE®. 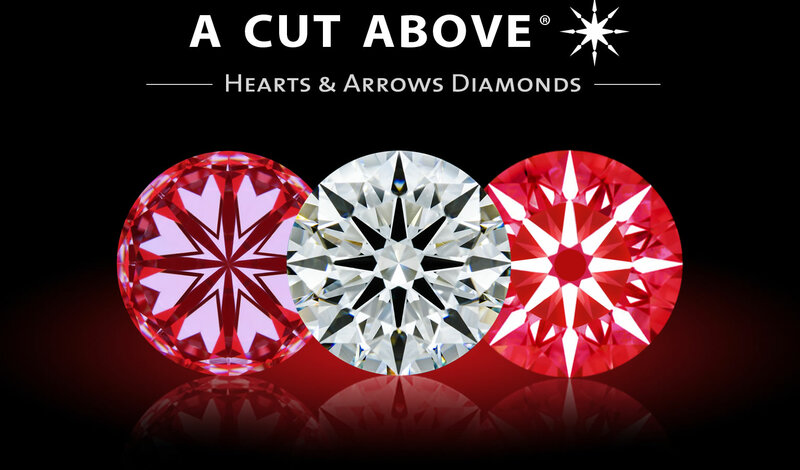 Discover more about the A CUT ABOVE® Hearts and Arrows Specifications here. Their tagline for the A CUT ABOVE® collection is: “Extreme Precision – Exceptional Beauty” . It is a bold claim; it is, however, strongly supported by the vast selection of imaging technologies offered by Whiteflash, which demonstrate the details and intricacies of the stone in question. But the real question would be, are they helpful? Like all things with Whiteflash, I believe it is the clarity of facts that make their high-tech offerings so impressive. The exact information for each diamond is readily available to the buyer. It is not hidden behind marketing gimmicks; rather it is illuminated in detailed reports. So, cutting through the jargon, my answer would be yes. Below I have detailed the various imaging reports used by Whiteflash for all their diamonds, including their A CUT ABOVE® collection. The first of these is a basic diamond image. A very magnified, high-res and an unedited photograph of the diamond. This will first indicate if the diamond is eye clean, and will also present the Hearts and Arrows patterning (if you know what you are looking for). Light return will appear as red, light leakage will be shown as a greyish color. The black is the obscuration of light. Think of this as an indicator of light return and sparkle. A poorly cut diamond will display lots of light leakage which diminishes the brilliance of a stone. ASET imaging is a more detailed vision on light return. It is a visual manifestation of the AGS cut grading system, demonstrating light intensity and leakage, as well as the contrasts necessary for creating the desirable scintillation. Optical symmetry, with eight arrows appearing when viewed through the table, and eight hearts when viewed through the pavilion. When looking at the ACA collection, you can see some of the most defined and balanced examples of Hearts and Arrows images around. Offering a full 360° view, the diamond video viewer presents the actual stone in all its glory, twirling under a light source. This allows the viewer to observe how well the stone interacts with the light and potentially identify any flaws or inclusions. The Princess is part of the A CUT ABOVE® family. Rather than round brilliants, it offers princess cut diamonds that boast peak light performance and unparalleled fire. As a minimum, an A CUT ABOVE® Princess must be awarded a Triple Zero AGS certification. AGS are the leading voice in determining the best specifications for this cut, as GIA reports do not offer the same detailed information to a buyer. The further specifications for a Princess cut stone are just as stringent as those of a round brilliant; ASET and IdealScope images are carefully analyzed to identify the diamonds light handling properties to ensure the ultimate brilliance. Whiteflash provide an in-depth look at AGSL diamond grading of the Princess cut on their website. As with all of their information, it is meticulous and exhaustive. Often, a cutter will opt to maximum yield when cutting a princess. This means the overall focus on cut and light performance within princess cut diamonds has historically been much lower than that of a round brilliant. It tackles a surprising gap in the market for princess cut diamonds that can match the stringent specifications of their round brilliant counterpart. Whiteflash have challenged this, with high performing Princess cut diamonds. Although they are held to different specifications than a round brilliant, the demand for excellence remains just as high. The A CUT ABOVE® Collection Series will appeal to those who appreciate the importance of each of the 4 C’s. I would agree that the cut is the most significant of the 4 C’s, however it is important not to neglect color and clarity for these also have a huge impact on the essential visual desire of a beautiful diamond. It must be at least a D, E or F in color (The bracket in which stones are considered ‘colorless’). It must be an FL-VVS in clarity (The bracket in which stones are considered microscopically clean). On the most basic level I would describe the A CUT ABOVE® Collection Series diamonds as ‘the best of the best’. If you are looking for a diamond that does it all, then you will find the Collection Series very handy; they are diamonds that are the top of all that is held dear in the diamond world. Does it make a difference? In my opinion, the simple answer is YES. A better color and clarity will always result in a more appealing looking diamond. As is the case with all diamond retailers, you will pay more for stones that fall into the top brackets of these specifications. How Good Are A CUT ABOVE® Diamonds? When looking at the ASET and Heart images provided by Whiteflash, it very quickly becomes clear that A CUT ABOVE® diamonds really are at the peak of diamond excellence. 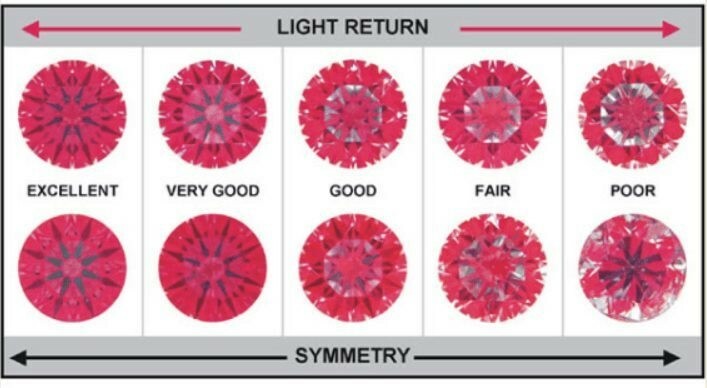 If we compare three random A CUT ABOVE® Ideal Scope images to the table above, it is clear that each demonstrates the desirable properties of an Ideal cut diamond. While not identical, I would be happy to recommend any of these three stones based on their symmetry and light performance. 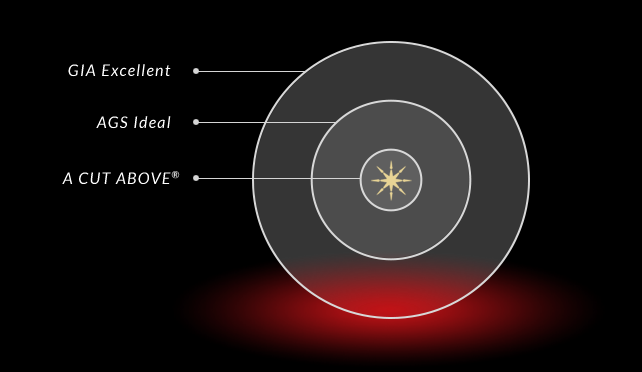 The specifications for an A CUT ABOVE® diamond are not based on mystery proportions or hidden beneath branding gimmicks. They are simply a very small percentage of exceptionally cut diamonds that display the necessary attributes to be considered world class. Yes. A CUT ABOVE® diamonds are good. In fact, they are some of the best. But the real beauty of an A CUT ABOVE® diamond, is the information and graphical evidence is at your disposal. You can see the quality for yourself. A CUT ABOVE® Diamonds really does tick all the boxes. Exceptional quality, great value for money and beautiful diamonds. 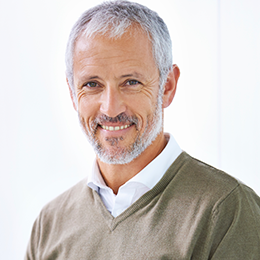 What really sets Whiteflash apart is their confidence in their product. By offering all the necessary documentation, you are empowered as a buyer to make choices based on specific qualities, as opposed to flashy marketing tactics. Search their A CUT ABOVE® Diamonds here. You might have to cut through the technical jargon and educate yourself in the art of translating diamond imaging, but Whiteflash give you the tools to do just that. Do they deliver on their promise of ‘Extreme Precision – Exceptional Beauty” Well, their collection is consistent in its exceptional quality, beauty and combined with a fair price A CUT ABOVE® should definitely be top of your list.